Democratic senators have been assigned conservative nonprofit groups to call out by name on the chamber floor in speeches on Monday and Tuesday criticizing corporations and advocacy groups for opposing Democratic climate policies, internal emails reveal. 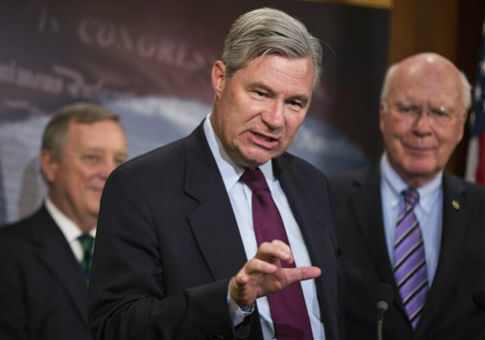 Nineteen Senate Democrats will attack specific organizations in what they are calling a "web of denial," according to a schedule of floor speeches circulated by Emily Enderle, a top environmental policy adviser to Sen. Sheldon Whitehouse (D., R.I.), who is spearheading the effort. Internal emails about the effort obtained by the Free Beacon reveal a highly coordinated plan between members of Congress and environmental activist groups to fuel a public relations and legal offensive against fossil fuel companies and groups they support. Enderle’s email also included graphics and suggested tweets to use "as guides as you craft digital content." According to her email, Whitehouse and his allies, including Senate Minority Leader Harry Reid (D., Nev.), have crafted a schedule for floor speeches on Monday and Tuesday that assigns each participating Senator at least one group to go after by name. Most of the groups have already been targeted by state Democratic officials that have undertaken a coordinated legal campaign against oil giant ExxonMobil since last year. Many were named in subpoenas sent to the company by state attorneys general as part of that effort. Whitehouse has been a leading proponent of federal racketeering charges against Exxon and other oil companies over allegedly fraudulent statements to shareholders about the financial impact of climate change. Environmental groups that Whitehouse has consulted on the effort have warned that such a strategy is unlikely to succeed. Attorney General Loretta Lynch recently referred the allegations to the FBI at Whitehouse’s behest. This week’s floor speeches are part of a PR push for a resolution introduced by Whitehouse and other Senators involved in the effort. It seeks to tie climate policy to decades-old legal fights over the dangers of tobacco smoke and lead paint. Enderle revealed that Whitehouse has been coordinating with leading environmental groups on the effort. "Thanks to LCV [the League of Conservation Voters], Sierra Club, Union of Concerned Scientists, Clean Water Action, and Public Citizen for supporting" the resolution, she wrote in an email before its text was publicly released. The resolution "urges fossil fuel companies and allied organizations to cooperate with active or future investigations into their climate-change related activities." The "tentative schedule" that Enderle circulated on Monday alerted offices to the following speeches and groups that would be targeted. "The schedule has been adjusted a bit," she noted in a follow-up email. "Senator Cardin is now expected to kick things off around 4:45pm today and Leader Reid is tentatively going to give his remarks tomorrow morning. This entry was posted in Politics and tagged Climate Change, Democratic Party, Senate Democrats. Bookmark the permalink.